ME: Hey, buddy. How was school? NICK: Nathan would NOT cooperate! ME: Uh-oh. What did that kid do now? NICK: He makes jokes that I don’t like! And he tries to trick me! ME: That’s no good. You just ignore him, okay? And tell the teacher if he really bothers you. 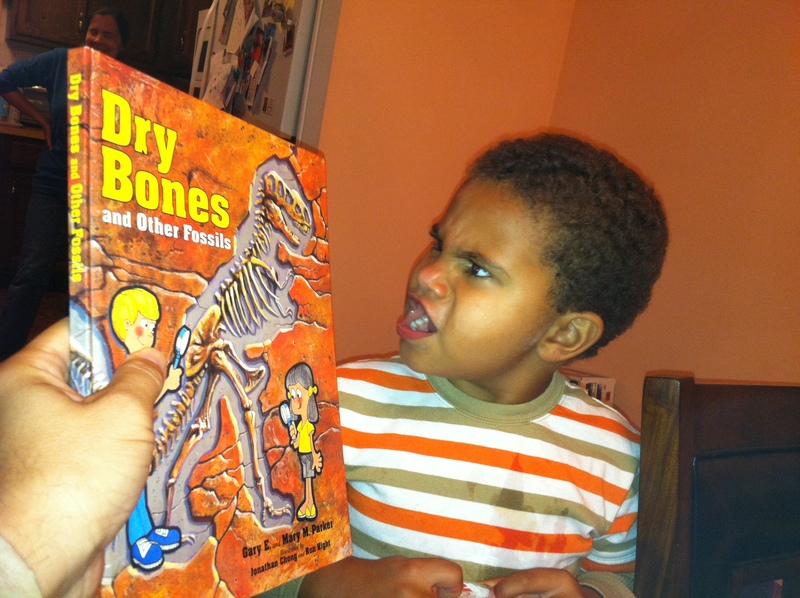 NICK: Read me this book. ALLISON: Oh, yes. That book. Where did you get that book again? ME: At the library book sale. I know he’s into dinosaurs and fossils and stuff so I grabbed it. It was in the kids’ section. ME: What’s wrong? You have crazy eyes. NICK: Read it to me, daddy. NICK: Pleeeeeaaaaase. 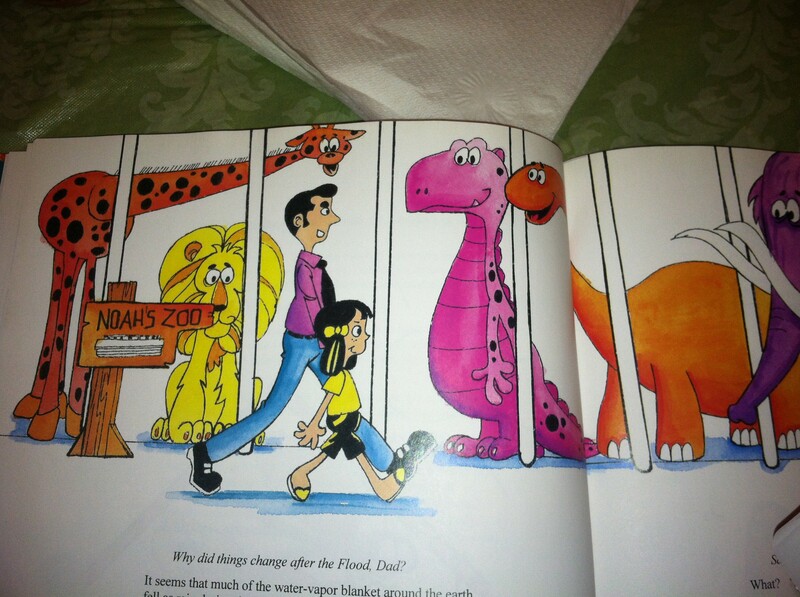 What this book called? ALLISON: Yes. Read it, daddy. ALLISON: So far, so good. ME: “God sent the great Flood to destroy evil and give the world a fresh start…all the violence and wickedness grieved God’s heart…” WHAT THE FUUUUUU…UNNY BOOK IS THIS? NICK: Why is it so funny? ALLISON: Look who the authors are. 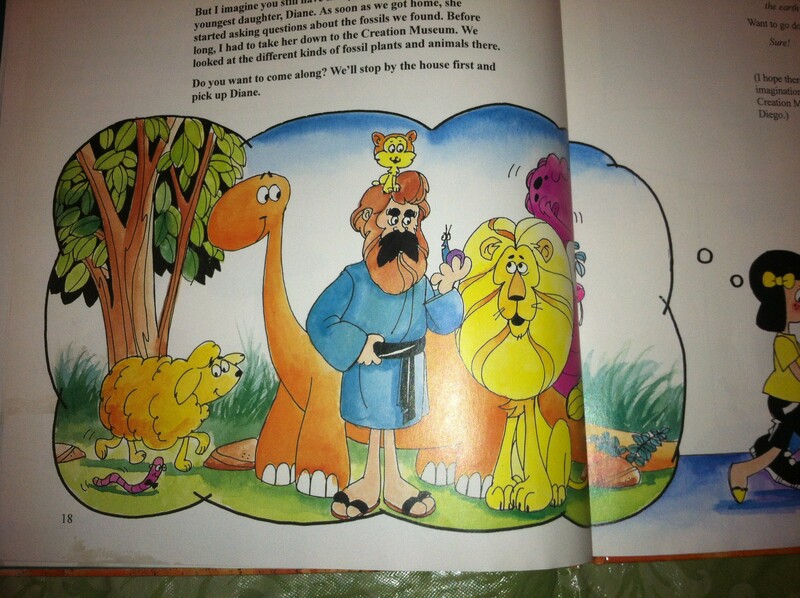 ALLISON: You brought a creationist children’s book into our home. ME: Nick, I can’t read you this book. ALLISON: Go for it, daddy. NICK: I wanna see! Who’s that? NICK: How he have a dinosaur on his boat? DINOSAURS CAN’T BE ON BOATS WITH PEOPLE! NICK: He have a dog! WHAT? How he can have a dog and a dinosaur??? ME: He can’t. That’s what I’m saying. This book says he can but he can’t. NICK: SOMEONE TRYING TO TRICK US WITH THAT BOOK! NICK: Give it to me! ME: What are you going to do with it? NICK: I gonna give it to Nathan! I gonna trick Nathan with it!